Emerald Isle: Stunning homes designed for luxurious living! Renowned developer L&T Realty has launched a beautiful new residential project called Emerald Isle at Powai, Mumbai. The project is aesthetically designed and filled with all the necessary facilities for a comfortable lifestyle. Situated on 7 acres of prime land, the complex has a total of 8 towers with 2, 3 & 4 BHK luxurious apartments ranging from 641.72 sq. ft. to 1631 sq. ft. (Carpet Area) The thoughtfully designed homes which are spacious and exclusive, offer an excellent combination of modern luxury and elegance with a unique character. The world-class amenities and facilities at Emerald Isle Powai will let you live in comfort and relaxation. The design of the project is absolutely amazing and will match up with your expectations as every nook and corner is fashioned to meet the demands and requirements of home buyers. It has an eco-friendly infrastructure which makes it an amazing complex to stay. Surrounded by landscaped greenery which gives pure air and provides a flow of natural light and cross-ventilation, the apartment provides a cosy place to stay. The complex has amazing facilities including modular kitchen with vitrified flooring and granite platform with stainless steel sink. It has air-conditioned rooms, high-speed elevators with power backup, CCTV surveillance at every entry and exit, video door phone with intercom facility, French windows in the living area, and a terrace pool. These world-class facilities will make you feel secure as well as provide you with luxurious surroundings. The project also gives you access to a plethora of external amenities which you can't experience at any other place. It helps you live the luxurious and posh life within a pleasurable ambience. Some of the facilities include library and reading room. For all those who want to stay fit and healthy, there are various opportunities like yoga and meditation zone, badminton and squash courts, tennis courts, swimming pool, skating rink, jogging track, etc. Also, there is an indoor games room with snooker, table tennis, and carom. You need a place to hang out and have good food; this project also has a cafeteria, lounge area, and more. For the ones who are fond of watching movies, there is a mini-theatre and a multipurpose hall for get-togethers. Starting at Rs. 1.76 crores, Emerald Isle price extends up to Rs. 4.48 crores according to the size of the apartment. The developer is also offering a number of payment plans, supported by multiple loan options to make it a flexible purchase. Located in such a spectacular location, the place is within a residential and industrial hub, while still being a part of nature. It is built at one of the most excellent spaces ensuring easy accessibility to the residents. 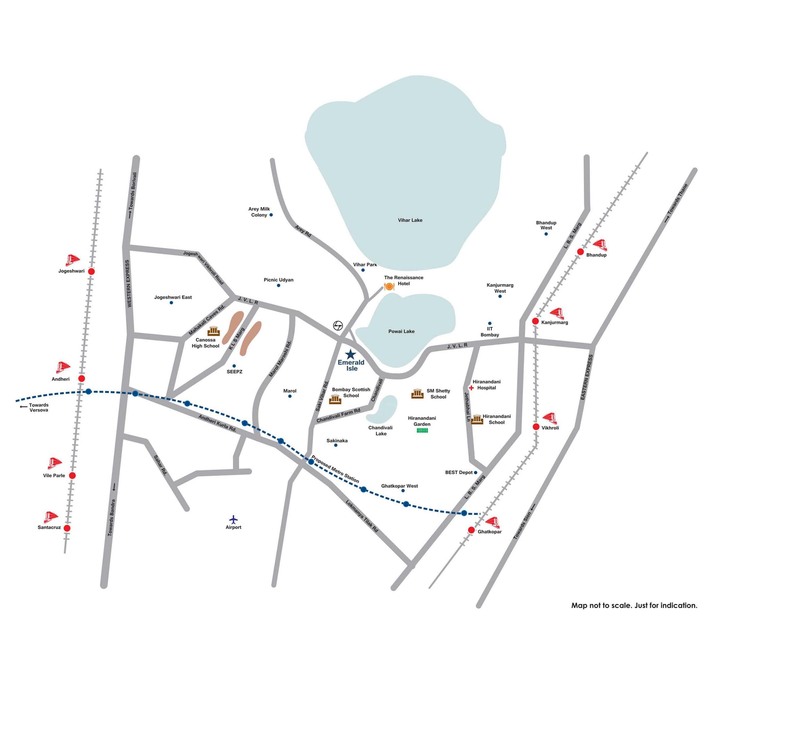 It is just 12 minutes from Andheri West and 19 minutes from the International Airport. All in all, the project compresses style and elegance. Renowned developer L&T Group aims to elevate your way of living with this new project. Buyers will experience luxurious living at Emerald Isle, somethingwhichyou have always desired for. So, come cherish each day of your life with your loved ones at this amazing place! A Part of an intergated gated community. Built arround 3 acres of sprawling central greens. 10 acres of open space. Gate no 6A, Off JVLR, Saki Vihar Road, Powai, Mumbai.